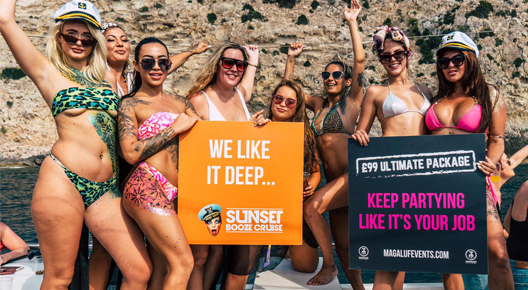 Magaluf's Biggest Award winning Boat Party is back for Magaluf 2019 with a Bang! Out on the Mediterranean, our famous Sunset Cruise- along with our international DJ's is unrivalled anywhere on the planet! Think of it as a floating festival, in the middle of the ocean, in the middle of the day! For those who want to cool off there is also a 30 minute swim stop! This is Magaluf's most popular weekly events package! Your holiday just got BIGGER!